After getting fed late last night (1 a.m.) we see they both rose to nearly the same level (blue line) and a bit more than double. At this point they’ve begun to recede so we give them another 1:1:1 [S:W:F] ratio feeding. At this time, 4 hours past the morning feed, they’ve risen and are just on their way back down. It’s hard to see in the photo but their high-water mark is just a little higher than the current dough level so they would have peaked in the last hour or so, probably. The experiment is hereby declared concluded. Both starters are expanding well on a 1:1:1 ratio and doing so in 4 hrs or less. Their next feed, we’ll bump up to a 1:2:2 [S:W:F] ratio so they have much more food to go through before running out. Specifically, we’ll do 20g+40g+40g for a total of 100g of starter. 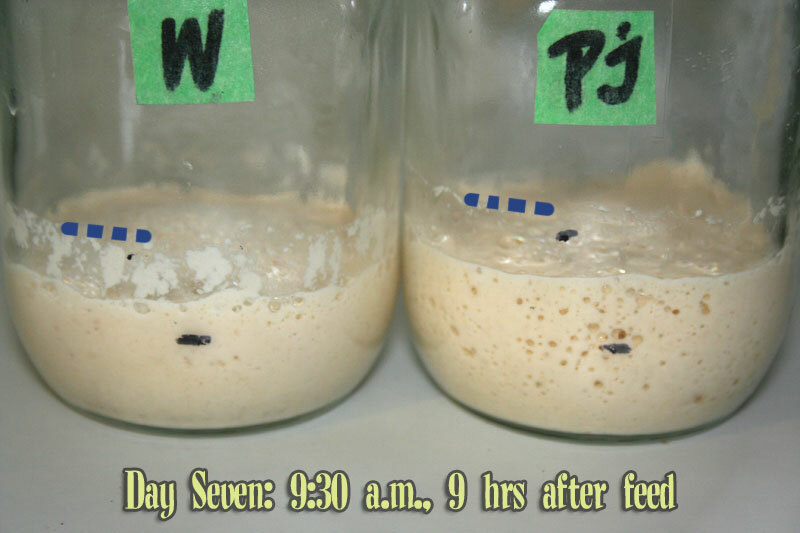 For the next week or two they’ll be busy getting ready for real life (so this is starter college, basically), They will spend the next while being fed and allowed to mature, making sure the yeast and LAB are well established. They’ll be kept out on the counter and fed twice daily to really get the cycle going. 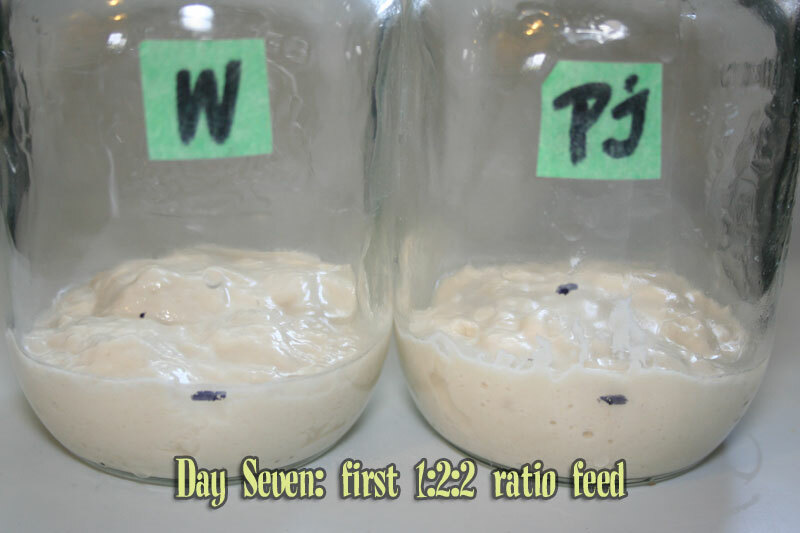 Here are a couple of final shots, 3.5 hours after their first 1:2:2 ratio feed, they’ve both more than doubles, likely even tripled. Then 6 hours after where there is a HUGE increase. I dare say PJ has hit 4X original size. I think at this point, there’s little question that they are both doing remarkably well. Wally will need another feed or three to completely lose all remains of the Stink but he’s smelling much better already. He has a definite sour to his scent with a clear yeast undertone. 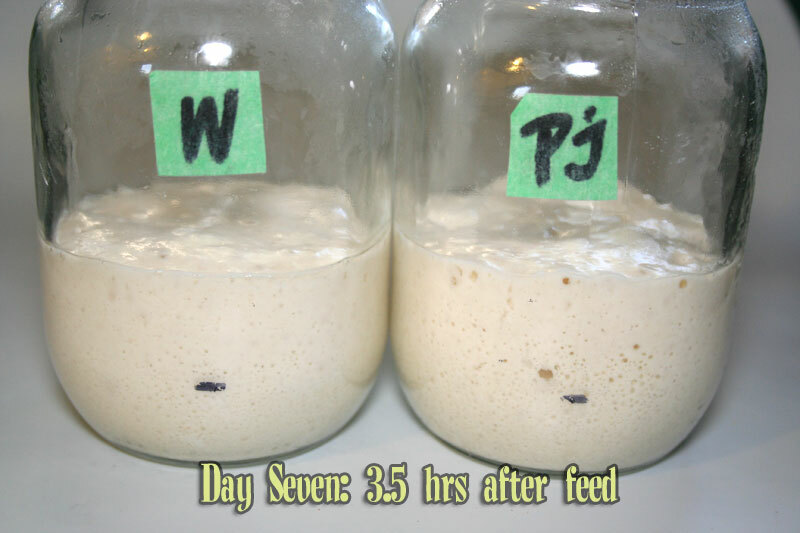 PJ, on the other hand, has a scent that is a bit smoother, a little sweet even, and not as tart although it looked, over the last few feeds, like he had a little more growing potential. That seems to not be the case now; Wally has caught up. But the boys are good to go and so it’s time to call this project officially finished. Mina is doing well in her new location! Thank you so much for the life story of Wally and Pj. I have prevously given up starters after the false rise, so it is great to see exactly what is happening. You have reinvigorated me. Up to now, I have mostly used the old bread method of getting quasi sourdough. 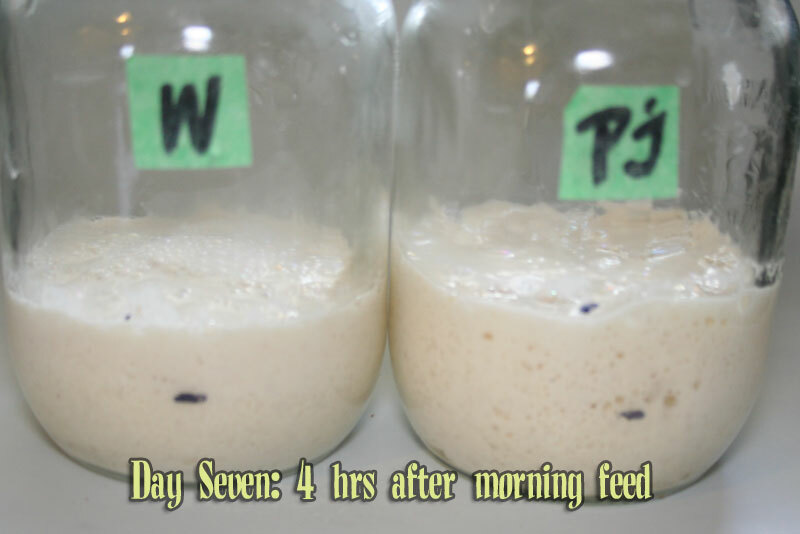 Make some bread using yeast. Then every long afterwards uses a pulled off piece of the previous dough as its starter. Now it looks as if I can do it properly. Do the starters need to be fed if they’re not rising? May they rose in the night and I missed it. Hi, Rita. Sorry about being a bit late on answering here. You should be able to tell if your starter is rising overnight if you make sure the starter’s jar is clean on the sides. I just use a small rubber spatula to squeegee the walls clean so that I can spot signs of activity the next day. It doesn’t need to be pristine, just clean enough that you’d see the “high water mark” if it rose then fell. If your starter is NOT rising after you’ve fed it, you could give it some more time before feeding it again. It may just be a bit sluggish. If it still hasn’t moved after 12 – 16 hours, ADD some flour and water without removing any old starter. If the issue is a very low culture population, removing some of the existing culture would make their population even smaller. So do a small addition of flour & water, preferably rye or whole wheat, and see if that doesn’t get the gang going. Can I feed my starter with durum atta flour? I’m trying Ed’s Sicilian no knead recipe from Breadtopia’s site and am trying to understand the characteristics of durum flour. It doesn’t respond with the vigor of rye, normal whole wheat or all purpose white. Do you have any experience with it? I’m intrigued that the Italians use it with success. Altho I found my flour at the Indian grocery store. I’m afraid I’m not familiar with that type of flour, other than seeing it on the grocery store shelf. Never used it, haven’t read anything about using it in bread or sourdough. This may be a good question to pop onto TheFreshLoaf.com and see if anyone in the vast army of members there has knowledge of it. Well, actually, I could probably guaranty someone does. Or you could certainly do a search for the term there and see what others have already talked about. 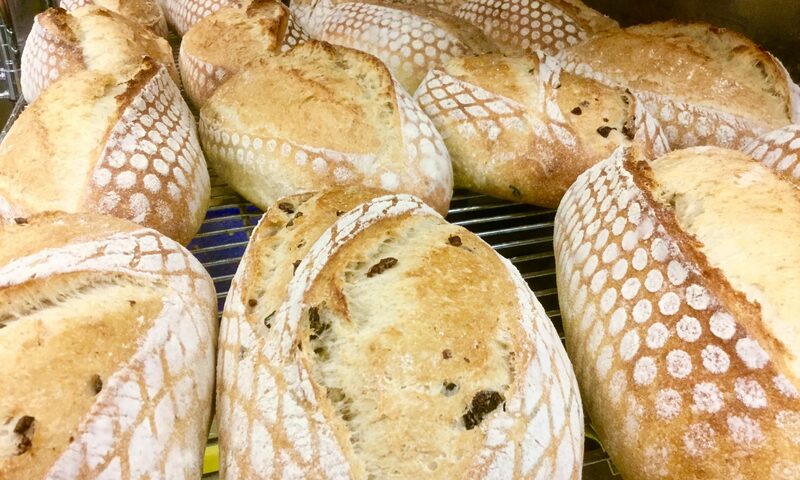 If that forum isn’t in your bread favourites list, you may well want to make sure it is! It’s a goldmine of info and full of massively friendly and helpful folks.